It all started when I saw the wreath below shared on facebook. I fell instantly in love! 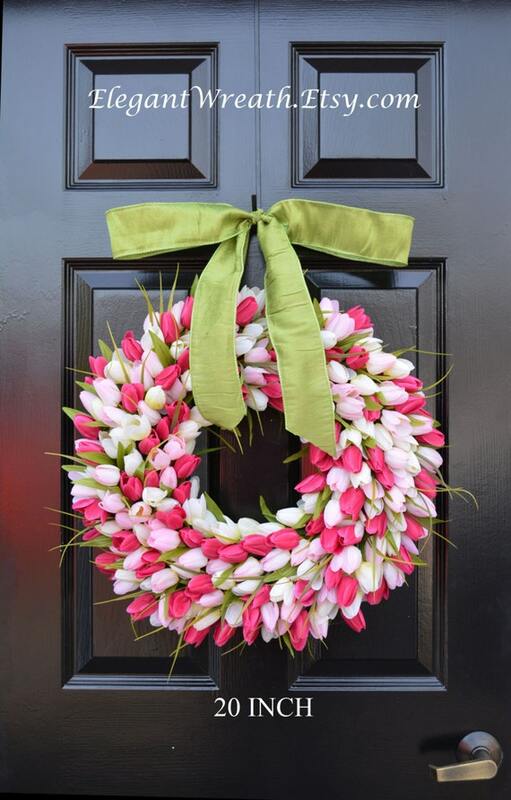 And determined to make a tulip spring wreath myself this year for my spring door. I had to do some digging, but finally found the source for the wreath pictured above. It is from an amazing etsy shop so if you aren’t up for making your own she has some GORGEOUS wreaths to choose from in all different shades and colors. But I love to make my own wreaths so I decided on a color scheme and gathered my supplies. I purchased the tulips from Michael’s a few weeks back when they had a 25% off your entire purchase including sale prices coupon. They normally cost $3.99 each but were 50% off and then an additional 25% off so $1.50 each. Some people said you could also buy tulip bunches at the dollar store but mine didn’t have any and I am sure would not be as big of bunches and maybe not as pretty either. So my wreath was just under $12 to make since I already had the grapevine wreath. You will want to cut apart each bunch so you are left with mini stems with 2-3 tulips on each one. That is what you will stick into your wreath. I have made many grapevine wreaths in my day and I always just stick the stems in without gluing or securing them. Yes, a few will fall out over time but they are easy to just stick back in. This way when the flowers fades or I want to use the wreath or the flowers for a different project they are easy to remove without messing up either one. But you may find that you want to glue yours – totally up to you. I just started sticking them in randomly trying to make sure I spread out the colors. You can either go around the wreath filling it all in as you go or you could put all the yellow flowers spread out all over the wreath, then red, then white. Which every way is easy for you. I do it both ways depending on what I am working with. I tied a white ribbon around the wreath and hung it on my front door and it was finished! The tulips look pretty real too. I would have loved to do pink and white but felt that bringing in some red and orange would probably work better with my burgundy door. And I am so glad I chose these colors – they are so bright and cheerful! And perfectly say spring to me! I can’t wait to get my flower pots filled with flowers, ferns up hanging in the breeze, and the porch all spruced up for spring. Especially after a weekend full of gorgeous 70 degree temperatures! But for now I am enjoying this little bit of spring on my front door. Are you counting down the days till Spring? I feel for you that had snow even today – sorry! Maybe if you hung a wreath like this on your front door the weather would get the message. Anyone planted some flowers, cleaned out your flower beds, or have ferns hanging outside yet? I am just waiting a few more days to make sure the weather holds – don’t want the frost to ruin all my hard work. LOVE it!!!! I saw your inspiration pic recently too and was so inspired. It’s so big and beautiful – perfect for spring!! Beautiful!!! What size wreath did you use? I am trying this today!!! LOVE the tulip Spring Wreath!! The colors are beautiful, and as always, your wreath turned out wonderful! Thanks for sharing! Love this so much, I may just have to make one after my grapevine wreath comes down off the mantle! I was gonna do yard work today but it is rainy and I am hearing there may be snow on the horizon! Cannot wait to get new mulch, trim bushes, and plant!!! I loved it so much that I went right to Michaels and bought supplies and made it this evening. Took me less than an hour to do. Love your tulip wreath! My problem is that I copied your spring all green square wreath for my front door this year and I absolutely love it!!!!! I am determined to not spend anymore money right now – I have four wreaths for the four seasons. Thank you for showing us your beautiful masterpieces! I find joy in just looking at them and reading about how you make them! Thank you so much! I LOVE this Christina! I was thinking I needed to do something for my front windows and may just have to give this a try. It turned out awesome and I love your spring colors too! Angie@SlipcoveredGrey recently posted..Ready For Spring and Flowers? Yea!! Finally a tutorial on how to do this beautiful tulip wreath. Thank you so much. That is so pretty! I’ve never seen a tulip wreath before and that is just gorgeous. Great job! I almost didn’t look this PIN up because it looked too pretty to be easy enough for ME to try. I’m glad I looked anyway! Thanks for the inspiration! I gotta try it! I just wanted to let you know that I LOVE your blog! Today I did a post on my blog about DIY projects for spring and I included a link to your Tulip Wreath! thanks for the link love, Caroline! Oh how pretty! I love the colors you chose! Thank you for sharing this with us! These are beautiful! When I made mine, I was a little worried that it would be difficult but surprisingly it was very easy!